Love of the outdoors and the consuming desire to create art have been constants in Lyndy Benson’s life. As a child he spent his summers on his grandparents’ farm. Growing appreciation for the animals, land and people who worked that land stirred him to depict his surroundings with pencil and paper. When paper ran short Lyndy took to tearing brown paper bags to use as his canvas. Whatever the surface, it was covered with depictions of the environment that so fascinated him. 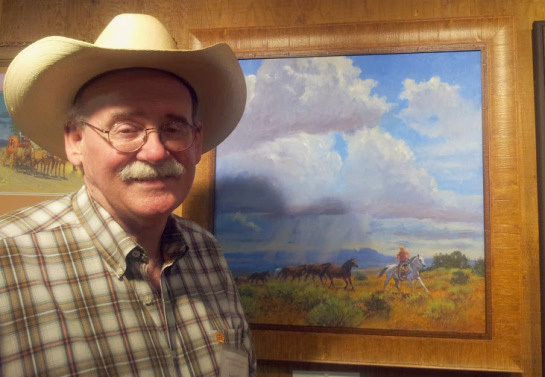 Growing up in Fort Worth, Texas Lyndy was inspired at a young age by visits to the Amon Carter Museum, where he viewed large collections of Charles Russell and Frederic Remington paintings. Seeing Lyndy’s interest in art, his parents enrolled him in art classes. His father, who also was an artist, had an influence on his young son, giving him encouragement and advice. Lyndy continued to expand his knowledge and abilities in college, where he majored in illustration. The learning was ongoing, as he also attended art workshops studying under various artist. He is very appreciative of the many private, public and corporate collections displaying his work such as Stetson Hats, Lockheed Martin, the Ranching Heritage Center, and the University of Texas. Lyndy is constantly growing as an artist in knowledge and experience. Though he has moved from brown paper bags to canvas, Lyndy’s fascination with producing art based on his love of the western experience has not changes in the least. Lyndy resides in Cleburne, Texas, with his wife Lisa where they raised their 3 children. You can own a museum quality fine art giclee print of Lyndy's paintings on archival canvas. Each is a limited edition and comes with a certificate of authenticity.